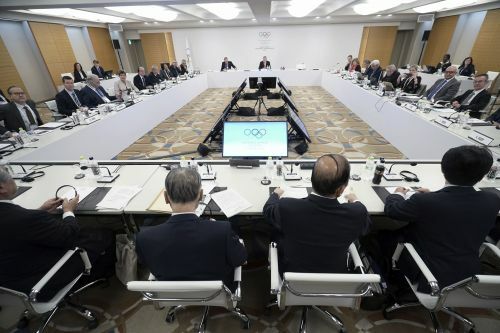 TOKYO (AP) — The IOC has set up an advisory committee on human rights chaired by Zeid Ra'ad al-Hussein, the former U.N. high commissioner for human rights. President Thomas Bach said Saturday at meetings in the Japanese capital that "human rights standards" will be included in Olympic host-city contracts, beginning with the 2024 Games in Paris. Bach said the IOC would not question China because it "has not the mandate nor the authority to solve the human rights problems" that are clearly "political issues." A recent report by Human Rights Watch said the internment centers in western China involved "arbitrary detention, torture and mistreatment." "These rampant abuses violate fundamental rights of freedom of expression, religion, and privacy and protections from torture," Human Rights Watch wrote. "We should concentrate on what we can really achieve and what we can really do," Bach said. "Promoting humanistic values in sport has been a core feature of the IOC since its beginning," Bach said in a prepared statement. "Our mission, to put sport at the service of humanity, goes hand in hand with human rights, which is part of our DNA."